Man it stinks that the network didn't buy at least a season of episodes. I actually don't own a copy of the cartoon or some stupid reason. Lots of VHS production work print and pencil test stuff but that's all. I remember watching it. Very nice job. Mabey you can still sell a series. Hey Bob, this is the same anonymous that asked you to post some Lucky Lydia stuff in the previous post. Thanks tons! It looked like a really fun cartoon. I think the short aired during the Big Pick in 2000 and ultimately lost to Maxwell Atom's Billy and Mandy? Is that right? Either way, it's still looks like a really fun cartoon and I wish I could see the short in its entirety. Maybe Arthur has the original cartoon? Man, that art is friggin' amazing! An all mighty thanks for the plug there mate! 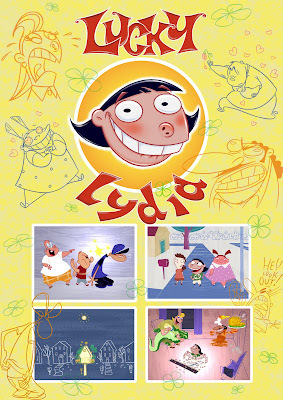 Now, I do have a copy of the Lydia pilot, however, it's a dodgy dvd burn and I would have to figure out a way to copy and compress it. Also I'm not sure about the copyright implications. Otherwise I would LOVE to post it up somewhere. I have to say that all the art and design stuff is Arthur. His talented wife Ona, was very involved with background design and color too. Methinks a chinese spam invasion has set upon thee. Arthur, if you could figure out how to get it online, it'd be great. If it's too much trouble though, don't worry about it. It looks like a great short though, and the reel I saw on your web was really nice! I think it will sell. I think the timing is right.